Walters, a Hirwaun based Civil Engineering, Plant and Development company, has chosen to partner with Teenage Cancer Trust in Wales as their new charity partner for 2017/18, with a goal to raise £20,000 over the coming year. 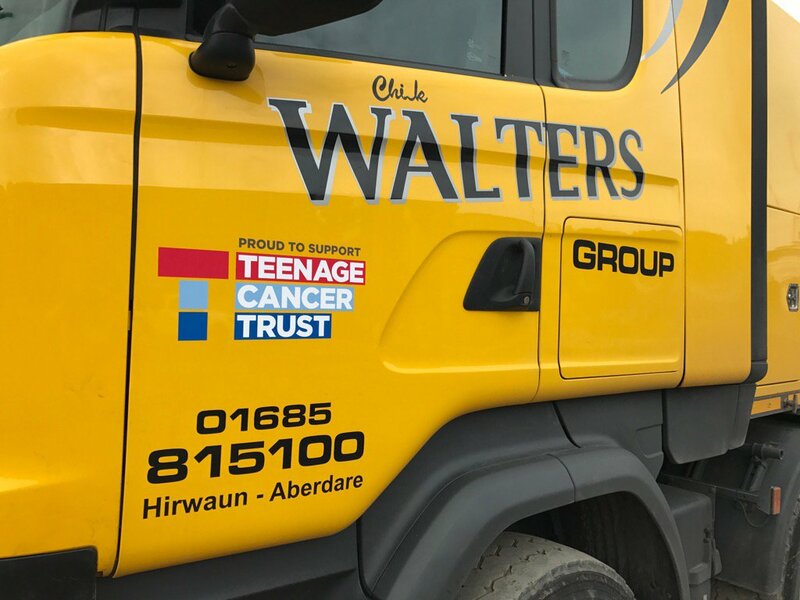 To kick off the partnership, Walters has liveried 3 of their low loader lorries to display the Proud to Support Teenage Cancer Trust logo and are looking to donate for every mile each lorry travels over the coming year with the hope of raising £10,000 from this activity alone. Walters are also set to welcome a group of young people supported by Teenage Cancer Trust’s unit in Cardiff to their sites in Wales for a day packed with activities, tours and treats. In addition to this they are currently undertaking the Smarties Challenge, which will see staff given a tube of sweets for free with the catch that they are encouraged to bring them back by the end of the month filled with donations. One tube filled with £1 would enable Teenage Cancer Trust to fund one hour of nursing care for a young person with cancer in Wales. Some of the money raised by Walters will be used to fund one of the specialist posts that the charity provides at its unit in Cardiff. Debbie Jones, Regional Fundraising Manager Teenage Cancer Trust, said: “Teenage Cancer Trust’s specialist nurses and youth support coordinators make a huge difference to the experience of young people with cancer in hospital. Despite all the hard work and progress, we have made in supporting young people, we still have a long way to go. For every young person with cancer we help, there is another we can’t.